Juliet Arku-Mensah is married with two daughters aged 7 and 11. 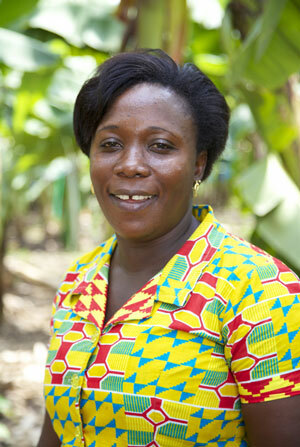 She is employed by the estate as both Fairtrade Officer and Occupational Health & Safety Officer. Previously a data entry clerk, Juliet was recently promoted in line with VREL’s commitment to the Fairtrade philosophy of empowering workers, particularly women. As management representative on the Fairtrade Joint Body, Juliet supports and advises workers’ representatives in selecting and managing projects funded by the Fairtrade Premium. As Occupational Health & Safety Officer, Juliet oversees the implementation of relevant workplace legislation, such as providing training and protective equipment and for organising health screenings to test workers for diabetes, hepatitis, breast cancer, typhoid, HIV and other conditions. A Ghanaian-Dutch joint venture, VREL was established in 1988 as the country’s first commercial export banana operation and was supported by the Ghanaian Government as part of its policy of promoting non-traditional agricultural exports. Volta River Estates Ltd (VREL) is a medium-size plantation located in the Akwamu area of Ghana’s Eastern Region. It produces conventional and organic bananas for Fairtrade and other export markets and employs more than 400 workers. VREL initially experienced major setbacks when Black Sigatoka fungal disease wiped out the first crop and access to the European markets was restricted by European Union import rules until their partial reform in 2006. In response, VREL developed a strategy of producing value-added products for niche markets. This led to Fairtrade and organic certification in 1996 and 2002 respectively and VREL has credited its survival during these difficult periods to access to the Fairtrade market and its guaranteed minimum price. Bananas are grown on four sites covering 250 hectares. After harvest, the bananas are washed, graded and labelled in four pack-houses. In 2012 VREL produced 4,400 tonnes of bananas, 67% of which are certified organic. VREL is a provider of much-needed local jobs, currently employing 441 people – 358 field and processing workers and 83 administrative staff – of which 28% are women, and has a goal of doubling production and increasing the workforce to 1,000. The workforce is 100% unionised. More than 95% are on permanent contracts and wage levels are almost 40% above the government minimum wage rate. VREL was among the first banana producers to become Fairtrade certified in 1996 and until recently was the only Fairtrade banana producer in Africa. Its bananas are available from Marks & Spencer and Sainsbury’s. VREL receives significantly higher prices for Fairtrade sales – $12.41 per box of Fairtrade organic bananas and $10.87 for Fairtrade conventional bananas, compared to non-Fairtrade market prices of $10.70 and $6.70 respectively (2012). In addition, VREL receives the Fairtrade Premium of $1.00 per box to invest in community development projects. The premium is paid directly into a bank account operated by the Joint Body (JB), a committee of eight workers who are elected to supervise premium-funded projects chosen by the workers. They are supported by two management representatives, including Juliet Arku-Mensah, who are appointed to the JB to provide practical assistance in areas such as accounts and project management. New school blocks have been built in three communities. At one of the schools some lessons had to be held outdoors under palm canopies which leaked when it rained. They now have a new school building, a computer lab and a head teacher’s office. Secondary education is highly valued by parents but beyond the means of many. The workers decided to invest in their children’s futures and now annually award around 20 secondary school and university scholarships to workers’ children on merit. An insurance scheme provides free healthcare for workers’ spouses and children. A hospital administrative block has been built. Clean water storage facilities have been constructed in three communities. Specially treated mosquito nets are distributed to protect against malaria. Part of the premium is being paid into to the provident fund, a pension plan for workers’ retirement. A bus has been purchased which workers can use for days out, social events, weddings and funerals. Management is encouraging workers to form women’s groups and the premium is being used to fund skills training programmes such as soap-making, batik and tie-dye as ways for women to start small businesses and increase their incomes. Some male workers drive taxis or commercial vehicles after work and others want a driving licence to increase their employment opportunities – so 15 workers have been selected for the first vocational driving course funded by the premium. Another scheme for men is the production and marketing of pasties to local communities.